"A thick, spicy and warming stew for the coldest of winter evenings." See how to make a super-simple chicken stew with carrots, peas, and mushrooms. Be sure to buy Spanish chorizo, not Mexican. Spanish chorizo has been smoked and comes ready to eat like kielbasa; whereas Mexican chorizo is raw and resembles Italian sausage. This stew was so good; however I think that if it was served with rice it would taste even better. If you don't like spicy food, then you may want to cut back on the red pepper flakes. Spicy!!! Like the chickpeas - very Spanish. This was a nice, hearty stew. I used chicken broth instead of water and added a little chili powder and cumin for an extra kick. 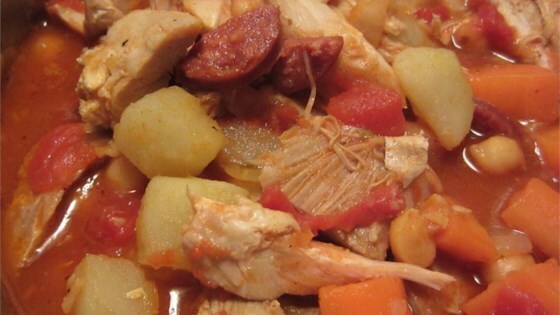 This is a great stew. Spicy and delicious.